When most people think of birders, retirees first jump to mind. You know… they’re older, not in the best shape and need a slow-paced hobby to keep them moving and fill their time. While many retirees enjoy birding, people of all ages can be found with binoculars trained to the sky. Many birders hold full time jobs and dream of the day when they can bird on a whim. 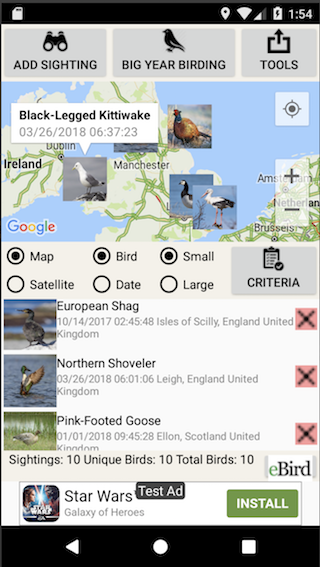 They long to get an alert from eBird about a rare bird sighting and simply drop whatever they are doing to go find the bird. Being in the latter group, my birding is limited to off-work hours and weekends. Sadly, by the time a weekend rolls around that rare bird spotted up north has often moved on. Today was different. Today I got lucky. 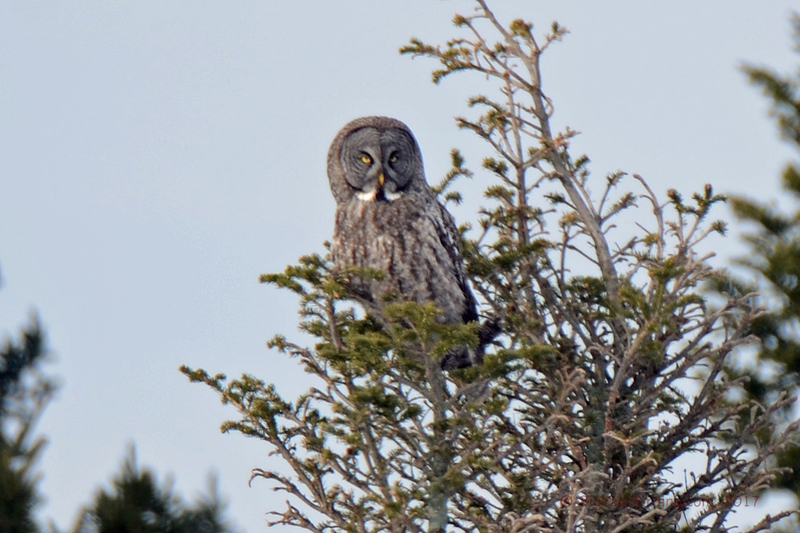 On Wednesday evening, the report of a sighting of the Great Gray Owl, a very rare bird for Maine, entered my inbox. It was seen just one hour north of my home. By Thursday afternoon the sighting was confirmed and later, two more birders reported it. Wow, this is for real, I thought! Ethan and I have to try to find this bird this weekend. Then it hit me: Wait, I am on vacation. This is school vacation week, and I am a teacher. I could go see this owl tomorrow! There was only one snag, Ethan, my constant birding partner, was away on a business trip and would not be returning until late in the afternoon. What to do…what to do! I could call Ethan and ask if he would mind me looking for the bird without him, but it was very late, he was already asleep and would still be so when I hit the road in the morning. Morning is prime time for bird activity. But for owls who hunt during the day, late afternoon toward dusk is another opportune time. I could wait until Ethan came through the door and whisk him off to look for the owl, but what if his plane was delayed and he got home after dark? As every birder knows, there is no guarantee of sighting a bird beyond the last moment it was seen. Time was of the essence. I decided to make the trip in the morning, and whether I spotted the owl or not I’d return in the afternoon with Ethan. That way, I thought, if the owl made its last appearance in the morning at least one of us would have seen it. I happily set aside my previous plan of sleeping in beyond my usual work day rising time of 4:30 AM, readied my birding gear and camera, and quickly got myself to bed. When I was the first one to arrive at the site in the morning I was a little concerned. Was I in the wrong place? Had I come much too early? Before I knew it however, several more cars quickly joined mine. Birders emerged from their vehicles, donned down coats and binoculars, set up spotting scopes and readied cameras. Several minutes passed and several more. This bird had been spotted in another nearby location yesterday and one clever and very brave birder (what if the owl showed itself while he was gone?) suggested he check the other location. Phone numbers were exchanged so quick notification could be made if the owl appeared in either place. Thirty minutes later, the magic text was received. The owl was at the other location. Birders ran for their cars and off we all went, observing the speed limit, but praying desperately that the owl would remain visible until we got a chance to see it. When we arrived we quickly learned that our journey was not done. The bird was still there, but at the edge of a woods, a half mile across a snow covered field! Putting on my trusty LL Bean boots as fast as I could, I ran with my binoculars and camera with its oh-so heavy telephoto lens through knee-deep snow (no, serious birding is not a hobby for the poorly conditioned!) and…There…He…Was! 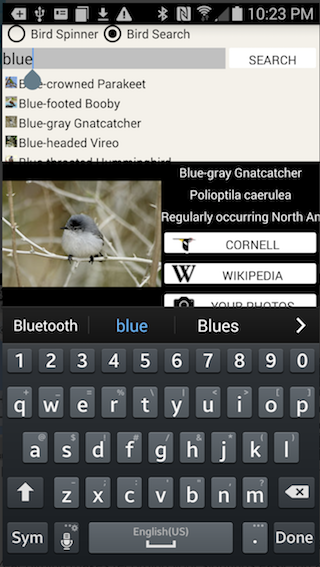 And in the brief moment it took to pull out my phone and type “Great G” into PVI Maine’s free Big Year Birding App I captured the bird, exact location, time and date! For two wonderful hours I watched and photographed this Phantom of the North, as the Great Gray Owl is known. Whether perched atop a spruce tree alertly scanning for prey, gliding silently through the air, or feeding on the ground, this magnificent bird thrilled me with its size, grace, and haunting beauty. I may never see another Great Gray Owl again, but I saw this one today, and I am grateful. Sometimes the moon, stars, work schedule and birds do align!